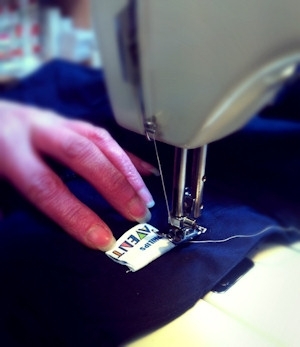 We can supply a Tax Tab, which is a woven or printed label to brand your garments with your company logo. It is a more subtle option and often the preferred choice for corporate clothing items such as suits and blouses. It is possible to recreate fine detail, portraying a professional and successful company. Adding woven labels has the advantage that the clothing is more easily identified as uniform by the Inland Revenue and not considered a fringe benefit. This is why they are often referred to a Tax Tabs. We can manufacture as few as 300 labels here in Britain. If you do not need all of them for your first order we will hold then for you ready for you to use on your next order. Manufacture of the labels takes around 3 weeks. Here are examples of the files we can work with, JPG, EPS, PDF, AI. However as long as the image you give us is clear we can create a quality tax tab to reflect your company image perfectly. If you order 1,000 plus we will manufacture a handful for your approval before manufacturing the whole order. Once the tax tabs are ready we can then sew them onto the clothing. They are usually positioned in a seam, pocket or waistband. We will of course offer advice for a professional final result and agree the positioning with you. The cost of sewing them onto the clothing depends on the positioning you choose and the complexity of attaching them. However it usually costs between £1.25 and £1.75 each.